Malta’s heritage, including Valletta’s landscape, was being destroyed for “cursed money”, Archbishop Charles Scicluna has said. Speaking during the launch of a book on a collection of 18th century statues adorning the Mdina Metropolitan Cathedral museum, Mgr Scicluna denounced those who were destroying the country’s heritage for a few euros. “If there’s anyone who is hearing me and has a part in this destruction of our heritage to make money, I implore him to think twice and say no, at least for the benefit of our landscapes. We are going to architecturally destroy Valletta for a few euros. And once we’re destroying, the money is cursed,” the Archbishop said. “I beg all Maltese, especially the younger generations, to remain attached to our rich cultural heritage,” he added. The collection of 15 silver statues featured in the new publication date back to between 1741 and 1743. They were made by Roman silversmith Antonio Arrighi and can be found in the first hall of the Mdina museum, known also as the ‘apostolato’. 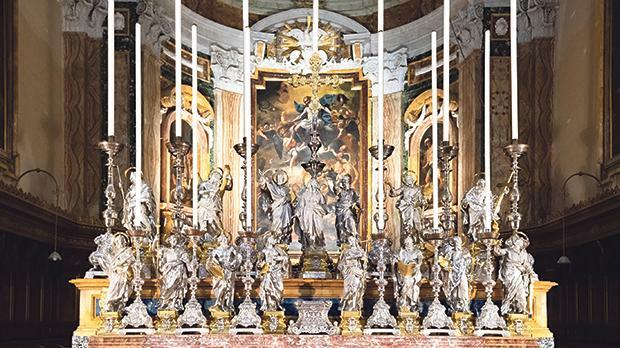 The statues, portraying the Apostles, John the Baptist, St Paul and Our Lady, had been commissioned by the Order of St John to embellish the main altar of St John’s conventual church in Valletta during the titular feast. Their design is based on the marble statues found at San Giovanni Laterano in Rome. During their brief stay on the island between 1798 and 1800, the French cleared several churches of their silverware to mint coins to pay salaries to their troops. In 1798, when the statues were still at St John’s, Canon Salvatore Susano informed the Cathedral Chapter about them and said it would be a great loss if they were to be melted with the rest of the silver confiscated from that church by the French. He proposed that, in exchange, the Mdina Cathedral would give the French silver and gold articles belonging to the cathedral equivalent in value to the statues. An agreement was reached on June 22, 1798 and two government officials accompanied an armed guard to the cathedral to take to Valletta six sealed chests containing gold and silver objects in lieu of the statues. The statues, however, had to be redeemed a second time after they were taken again by the French when they were exhibited in August 1799, when 449 pounds worth of silver articles, valued at 11,563 scudi, about €260,000 in today’s money, were handed over to the French instead of the statues. Throughout the year, the statues are exhibited in the museum but are displayed on the main altar of the Mdina cathedral on three occasions: Christmas, the Conversion of St Paul and L-Mnarja, the feast of St Peter and St Paul. Mgr Scicluna drew a parallel on the way heritage had been exchanged for cash in the 18th century and how this also applied to the present day, when, in his view, the same thing was happening.